Lens Color black/blue/silver/grey Size Lens Width: 2.28'' Lens Height: 1.88" Frame Length: 5.62" Bridge Width: 0.78" Arm Width: 5.51" Package 1x Sunglasses 1x Soft Glasses Cloth 1x Spectacle Glasses Case 1x Screwdriver 1x Exquisite Packaging Carton FEIDU SUNGLASSES Style and Quality is what we convey to our customers. Make You Look Good with unique designs from FEIDU.It's cheap travel accessories,but not a look cheap sunglasses .Provide a high clarity vision in front of you to see clearly and more comfortably. 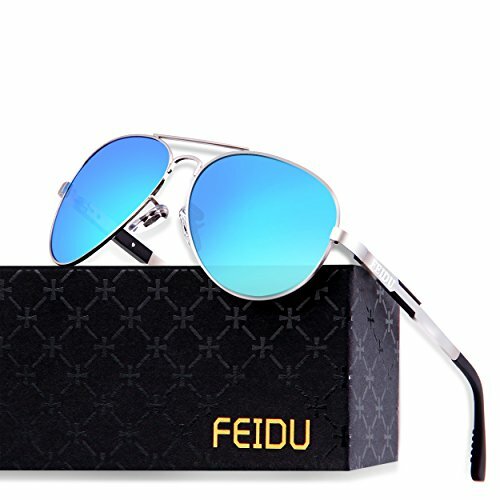 FEIDU FD9001 Polarized SunglassesIt's Lightweight , Heavy-Duty, Shatterproof, gives you stress-free wearing experience.A mirror sunglasses necessary accessories in summer.Our aviator sunglasses is heavy duty and unisex,siutable some people want find women's sunglasses or aviator sunglasses for men . Features The Filter Category of these Sunglasses is 3: General Purpose Mirror Sunglasses. Purchase from WSUK with confidence that the glasses you receive are fully CE certified and 100% UV400 protective. 100% UV Protection Filter out 99% of reflected glare without haze or optical distortion. Protect your eyes and enjoy a high clarity vision more comfortably. 2017 Brand New Italian Design Aviator wrap around design. The fashionable sunglasses style on 2017 and selling on Amazon .Looks low-key but reveals your high-end taste and style .It's good accessorie sunglasses for men women . Suitable for Outdoor Activities Men and women alike, whether you're into driving, fishing, baseball, golf or other sport ,men women sunglasses is necessary, if you love this classic retro looks. POLARIZED HD VISION LENS - 100% UV400 protection coating, blocks 99% harmful UVA&UVB rays. Reduce glare reflected off of roads, bodies of water, snow, and other horizontal surfaces. Restore true color, eliminate reflected light and scattered light and protect eyes perfectly. ALUMINUM MAGNESIUM METAL ALLOY FRAME - Aluminum &Magnesium Alloy makes frame strong and light. These aviator style polarized sunglasses for men were also constructed with reinforced metal frame and special designed spring hinges to ensure durability and avoid breakage while engaging in outdoor recreation activities. EXQUISITE STORAGE BOX -We provide an exquisite sunglasses storage box as well as a lens cleaning cloth and a small screwdriver with both plain and cross head tips for any adjustments if needed in the future. FASHIONABLE 2018 DESIGN - The fashionable Italy aviator design is the most popular style of aviator sunglasses selling on Amazon. This classy and polarized aviator sunglasses for men is designed to suit both men and women as an effect aviator accessory, fashionable decoration and daily wear driving sunglasses. FEIDU WARRANTY -All FEIDU customers enjoy 30 day money back guarantee. Customers can return and get refund in case the purchasing is not satisfactory for any reason. You have no risk to try and we will provide you the best service.